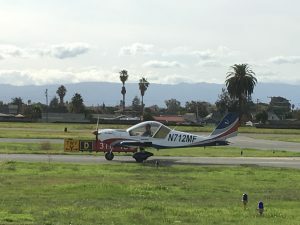 Congrats to Greg on his first solo! Greg flew 3 takeoffs and landings at Reid-Hillview (KRHV) in the SportStar with Instructor David watching carefully. “I’ve always been fascinated by things that fly. Becoming a pilot was on my ‘bucket list.’ On the first flight with David when he said, ‘Take the controls,’ I was forever hooked. Major Awesomeness ensued. It was the first time I was sitting in something that I was flying. I’ve been flying various model aircraft using radio signals for over 30 years. 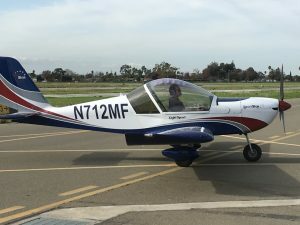 Last year when the FAA announced its rules for piloting drones professionally, it finally gave me the justification for spending the time and money to become a pilot. I’ve been an engineer for 36 years and am looking forward to doing something different. My Dream Retirement Job would be to fly UAS for a public safety organization. Getting my pilot’s license is the first step toward realizing that dream. Tags: first solo, reid-hillview, sport pilot, SportStar, student pilot.